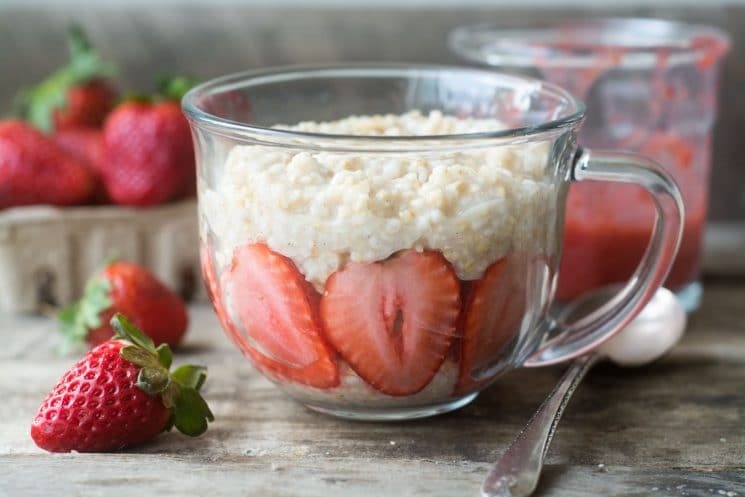 Hey everybody, it’s Sue from The View from Great Island and I’m bringing you one of my all time favorite ideas today — Overnight Strawberry Steel Cut Oats is made for busy mornings and hungry families, you’re going to love this quick and easy healthy breakfast! There’s so much hype these days around exotic ‘super foods‘ that it’s easy to forget about the super nutritious foods that we have sitting right in our kitchen cupboards every day. I’m a big fan of oatmeal, and as far as I’m concerned it’s one of the best perks of winter. Overnight oats has been a game changing discovery for me, and it revolutionizes breakfast in our house. It’s also absurdly easy, too, why didn’t anybody tell me about this before?? STEEL CUT (aka pinhead) are the whole oat groats (groats are the whole grain) that have been chopped into a few pieces. This is the most traditional form of oats for oatmeal. They take the longest to cook, but have the best texture and flavor of them all. 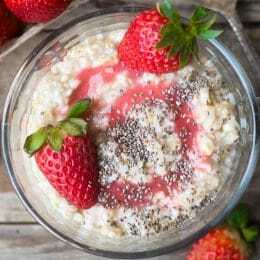 Steel cut oats have a slight edge over old fashioned rolled oats in terms of nutrition. They’re both high in fiber and protein, but steel cut oats rank lower on the glycemic index, (that’s good!) because they take longer to digest, and so they are slower to convert to sugar. They’re my favorite. ROLLED, or OLD FASHIONED oats have been steam softened and flattened (rolled.) They can be eaten as is, or cooked. 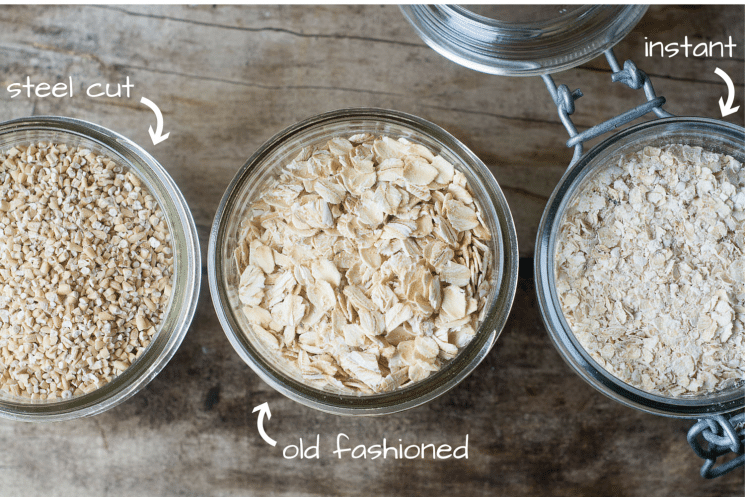 You can use rolled oats to make granola and muesli as well as oatmeal. INSTANT or QUICK COOKING oats are flattened even more, so they cook even faster. This is a good choice for introducing oatmeal to very young children, but it lacks the character of the other two. So steel cut are my oats of choice, but they take the longest to cook. Who in their right mind wants to stand over the stove in their pajamas? 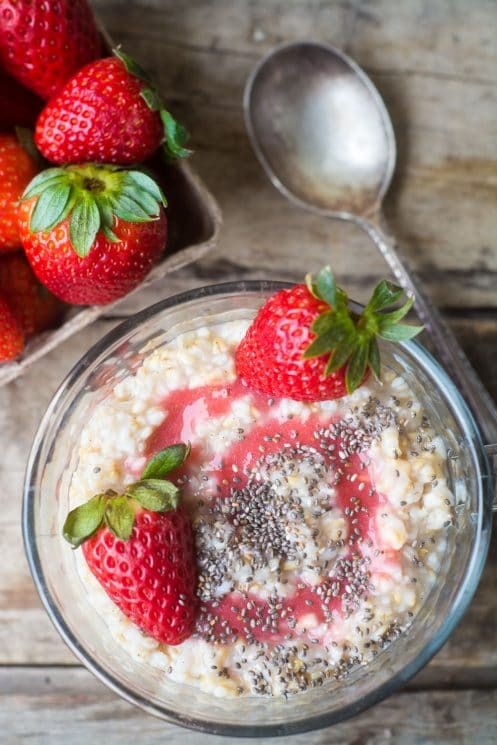 You can throw this together right before you go to bed, and wake up to perfectly creamy oatmeal. How does it work? You bring the water and oats to a boil, turn off the heat, cover, and leave the pot on the stove over night. The oats slowly absorb the water and become tender. Then all you have to do is heat through and serve with your favorite toppings. Pretty neat, huh? I’ve got tons more neat breakfast inspiration, including more overnight oat recipes, on the blog, here. The secret to this recipe is that you get a lot of natural sweetness from both the vanilla bean and the strawberries. Even winter strawberries are wonderful in this recipe. When you puree them their natural sweetness will intensify, no need for any added sugar! The two flavors together, along with the nutty oatmeal, makes a heavenly breakfast. You’ll find Sue over at The View from Great Island, where she’s busy cooking up all kinds of fun in her kitchen — stop by and say hi! Before you go to bed, put 3 1/2 cups filtered water in a large sauce pan and bring to a boil. Prepare the vanilla bean by slitting the bean open along its length with the tip of a small knife. Pry the bean open to expose the seeds. Once the water has come to a boil, stir in the oats and the vanilla bean and boil for 1 minute. Turn off the heat, cover, and go to bed. In the morning, reheat the oats in the pan. Hull and slice half the strawberries and puree the other half in a blender or food processor until smooth. 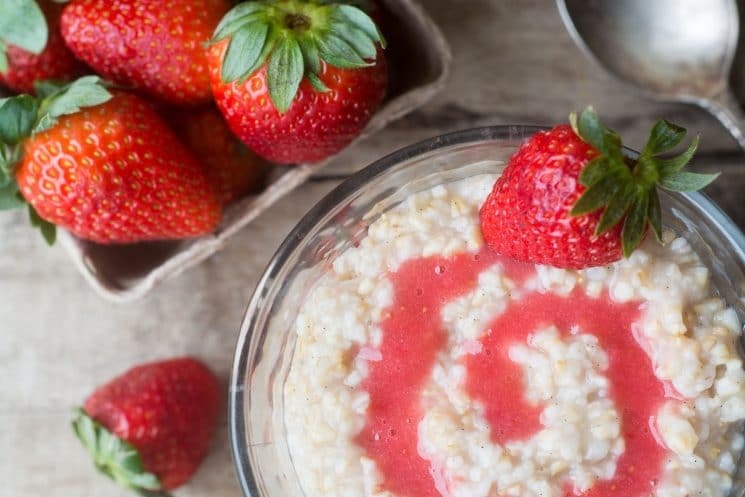 Layer the hot oatmeal with the strawberries and strawberry puree. Serve hot with a little milk, cream, coconut milk, or almond milk. Sprinkle on chia seeds or other garnish as you like. Don’t forget that steal cut oats are by far he most expensive of the three, that why I use old fashioned. I’m guessing it won’t be as strong, but could you use plain ol’ vanilla extract? This looks good, but I never have vanilla beans on hand. In fact, I don’t think I EVER have! I was so excited about this. I came down this morning and my oats were green on the top… My husband suggested it could be from the stainless steel pot but ours are really high quality and I’ve never seen anything like it. Needless to say we couldn’t eat them. Sad day! Abby, I read on another blog that if you use tap water to soak the oaks over night the greenish layer on top frequently happens and it has something to do with the alkalinity of the water; the writer recommended using pure filtered water to avoid the problem. Best of luck to you as this recipe does look really delicious!